The moment I saw H&M's corduroy skirt suit in the Oxford Street store, I knew the brand was onto a winner. 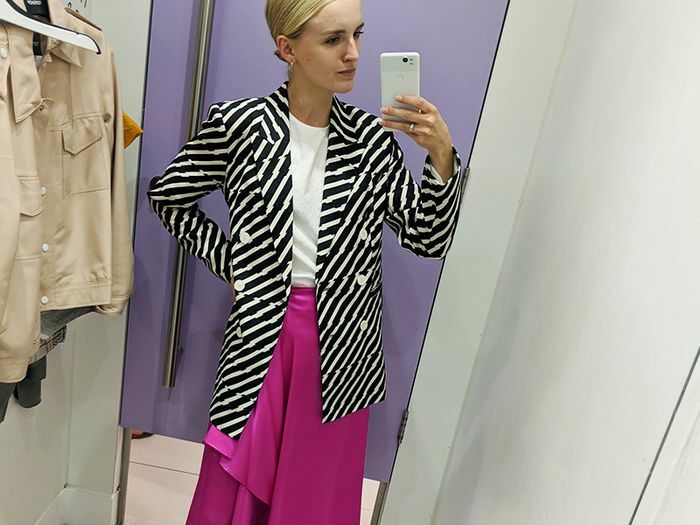 Maybe it was the power blue hue (which is set to soar this autumn) or the on-trend corduroy fabric, or perhaps it was the unusual pairing of mini skirt and long-line blazer… Whatever it was, it certainly looked much more expensive than its sub-£100 price tag. It came as no surprise then that the look has quickly taken to Instagram, cropping up on a number of stylish feeds. It's perfect for the not-quite-autumnal weather we're having at the moment, and the consensus on how to style the suit seems to be a white tee and delicate chain necklace. We also love how Milla Kuoksa has accessorised hers with a pair of '60s style white boots. The suit is also ideal for those wanting to dip their toe into the corduroy trend, due to its flattering blue hue (some of the high street's brown iterations can be intimidating for first-timers). This look isn't going to stick around for long, so get it before it goes! Scroll down to see our favourite looks and shop the suit.